This steel-reinforced press-brake punch and die, produced via 3D printing, reportedly reduced costs by 86 percent and lead time by 88 percent as compared to traditional machining. Centerline Engineered Solutions, a Greenwood, SC, contract engineering and fabrication business, has deep roots, tracing back to 1918 when Alfred Proctor Aldrich founded Aldrich Machine Works. In 2004, the company merged with Swofford Engineering, and Centerline was born, bringing to bear a formidable array of machining, laser-cutting and bending capabilities to design, develop and deliver parts, as well as repair machinery. Chances are that Aldrich did not foresee the advent of CNC machining and laser cutting, and most likely he would not know what to make of a newer Centerline capability, 3D printing. The fact is, businesses do not last for a century by doing the same old thing. As technology has presented itself as a viable option to forward the core business and offer success in new areas, Centerline has adopted and adapted. Today, the company offers 3D-printing consulting, designing and manufacturing services for customer parts, tooling and prototypes, using metal and nonmetal base materials. The transformation began a few years back when Centerline management realized that time spent machining tooling and fixtures could be better spent on end parts, and CEO Phil Vickery explored alternatives, including additive manufacturing (AM). Centerline had to turn down projects simply because customers’ budgets could not cover the tool and fixturing costs required to make the parts. On low-volume parts particularly, recalls Vickery, the company struggled to find affordable tooling solutions. This resulted in money lost for Centerline, and customers began looking elsewhere for suppliers. “It gets more costly each and every time a part touches another person and another operation,” Vickery explains, noting that costs escalate rapidly on parts requiring multiple machining operations. With cost and lead-time savings enabled by 3D printing, Centerline Engineered Solutions was able to meet customer requirements for production of a limited-run part via development and printing of a press-brake tool. Employing the technology, Centerline has printed everything from fixtures for inspection, welding and assembly to custom tooling and end-use parts shipped out to larger clients. 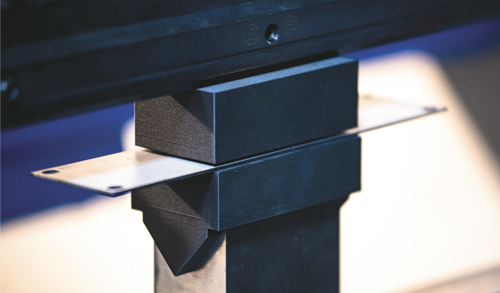 Recent work on a press-brake tool illustrates the printer’s positive impact. A customer had asked Centerline engineers to bend and form a custom sheetmetal part. Because the customer needed only two parts, the engineers expected tooling costs to exceed what the customer was willing to pay. “To make a special die for a press brake is very expensive—we’re talking $1000 to $2000,” Vickery says. So he and the Centerline team suggested a 3D-printed punch and die, but the customer believed that AM tools would not form its parts. Centerline set about printing the punch and die via the Mark Two, using Markforged’s Onyx composite material, which boasts 1.4 times the strength and stiffness of ABS plastic material, according to company officials. In producing the tools, Centerline personnel paused printing midway through to reinforce critical points with steel inserts, then continued. The resulting tools provided a pleasant surprise for the customer, as, backed with the steel-reinforced forming features, they easily shaped a laser-cut sheetmetal blank. The tooling cost less than $200 to print, according to Centerline officials, representing an 86-percent reduction in costs for the customer as compared to a conventionally manufactured tools. Not only that, the quick print work reduced project lead time by 88 percent. 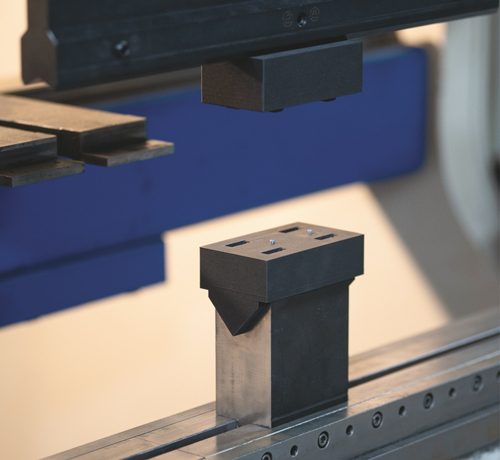 The press-brake-tool case study showcases AM capabilities available to metalformers and fabricators, and Centerline has made it a point to extend the technology’s benefits. The company has printed everything from fixtures for inspection, welding and assembly to custom tooling and end-use parts shipped out to larger clients. That’s a far cry from Vickery’s initial interest in 3D printing, when he thought the technology only would work for prototyping. These days, the company’s workflow now includes consideration of 3D-printed fixtures and tooling on many of its manufacturing projects. Centerline engineers and machinists were skeptical early on, as well. Once Vickery proved that he could make strong parts at a fraction of the cost, his team quickly got on board. Since then, he reports regularly being approached by team members with ideas for parts and tools to be printed instead of machined. Information for this article provided by Markforged, Watertown, MA; 866/496-1805.